London’s iconic Kensington Roof Gardens was the setting for the prestigious ceremony this afternoon (June 15) to recognise individuals who have “overcome significant challenges” to achieve their goals and lecturers who have “gone the extra mile” to help their students achieve. Dubbed as the “Oscars of skills education”, the Lion Awards marks the culmination of the Medals for Excellence awards programme, which dates back more than 100 years. BBC breakfast and Celebrity MasterChef presenter Louise Minchin and managing director at City & Guilds Kirstie Donnelly hosted today’s ceremony. 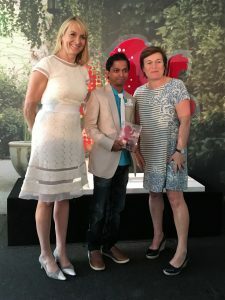 Sandesh Naik picked up the award for outstanding achiever of the year – and Kirstie Donnelly commented that ‘It was so fabulous to hear the stories and there is no doubt Sandesh was the “winner” on a number of fronts’. Sandesh, who studied a level two certificate in design and craft – conservation and restoration at The London School of Picture and Frame Conservation, was faced with “severe barriers” to overcome in order to pursue his passion for art, according to City & Guilds. An India citizen, Sandesh was told that art was for “wealthy students who did not need to work”. He independently managed to fund his studies by painting murals for hotels at night, props for carnivals, the gates of temples and any other work he could find. Given that there are more than 2 million students each year studying some kind of C&G qualification, this award is truly special and the presentation to Sandesh was the grand finale to the Medals for Excellence programme. 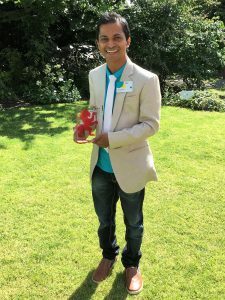 Sandesh is the first Indian national to win a Lion Award, and is the first student from Asia to win a Medal for Excellence in Picture & Frame Conservation.